There are some places along the bountiful Noosa River where you feel as though you could hold a plate out over the water and wait for your dinner to jump on. At the Noosa Boathouse restaurant, which floats alluringly on the river at Noosaville, you can almost do just that. At least you could if executive chef Shane Bailey happened to be taking delivery straight from the boat of one of his local suppliers. In a truly sea-to-plate experience that makes the menu here just about as fresh as it is possible to get, fishing boats deliver fresh spoils directly to the restaurant’s watery doorstep. It might be a boat from Soulfish – a Coolum Beach-based seafood company that boasts “the freshest seafood on the Coast” – that is dropping off its latest catch. Shane says Soulfish owner Dan Learoyd texts him when the fish are biting so Shane can put his order in. He draws on several other suppliers as sources of seafood, including Mooloolaba-based Fraser Isle Spanner Crabs, who collect the sweet, succulent bounty from the pristine waters off Fraser Island. Apart from crab, regular seafood inclusions on the menu may include prawns, cuttlefish, mahi-mahi, snapper, parrot fish, cobia, Hervey Bay scallops and Moreton Bay bugs – depending what the ocean is offering. 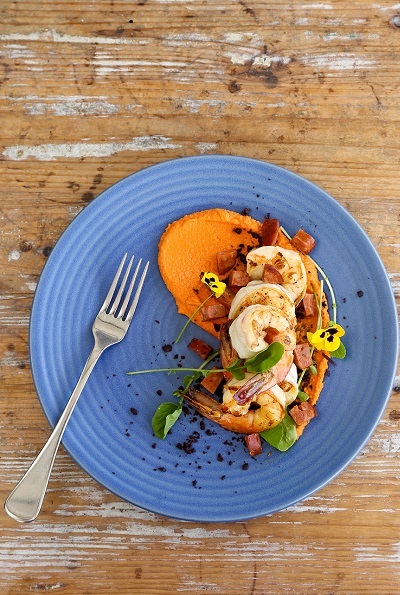 If you don’t feel like seafood, there are plenty of other options on offer at Noosa Boathouse. And Shane’s philosophy of sourcing seasonal, local ingredients to maximise freshness and flavour extends across the entire menu. “I just try and use as many local suppliers as possible within our region; less food miles means the food should be fresher,” he says. Shane uses five different meat suppliers in the region, who all specialise in different types of meat. There are also several local boutique produce suppliers who keep Noosa Boathouse’s kitchen well stocked. “I’m always looking out for new products, plus I have been using some for a long time,” says Shane. One of these long-time partners is the Cedar Street Cheeserie in Maleny, where bespoke cheesemaker Trevor Hart hand-makes fresh cheeses such as mozzarella, bocconcini and haloumi from local Maleny buffalo milk. Another regular supplier is Nolan Meats in Gympie, whose grain-fed beef has graced the steak menu at the Boathouse for the past few years. But it’s not just freshness Shane is interested in when it comes to produce. There’s also a strong ethical component to his choices. This year, he’s featuring Rhodavale Pork, also from Gympie – a certified free-range pastured pork pig farm where, unlike conventional pig farming, the pigs live outside in the grass and mud, and are free from hormones and antibiotics. Similarly, the eggs Shane uses come from Sandy Creek, a farm in the Mary Valley that produces real free-range eggs from hens who wander among the macadamia trees. Shane describes these eggs as “the best I’ve ever eaten”. Lettuce Alone Hydroponics, a local hydroponic farm, supplies freshly picked herbs, flowers and lettuces to the restaurant, while oyster mushrooms come from Noosa Earth, a sustainable spray-free farm that grows its mushrooms in used shipping containers with spent coffee grounds. Noosa Boathouse also has its own kitchen garden, which supplies garnish and herbs to adorn Shane’s culinary creations. As well as ensuring diners have an extra-sensory taste experience, Shane’s emphasis on locally sourced ingredients has the spin-off benefit of giving him invaluable insight into seasonal trends and availability, which has always dictated his ever-evolving, seasonally aware menu. Meeting with the farmers and growers who supply his ingredients allows him to do just that, and is one of the things he loves most about his job. “They love a chat, like me, and are always passionate about what they do,” says Shane. “This gives me inspiration and a reminder to respect and not waste the ingredients. It’s also important in sharing ideas; it would be unusual to find a farmer or producer who doesn’t love to cook with their produce. This summer, diners at Noosa Boathouse can look forward to some of the best local tropical delights the region has to offer. As far as constantly changing elements such as the weather, which can adversely or positively affect supply, Shane has to be prepared to expect the unexpected. “I expect that things can change very quickly so I need to be able to adjust,” he says.